Erimi village is west of Limassol and casually sits between its more famous neighbour Kolossi village, home to Richard The Lionheart and Episkopi village in whose district boundary lies the lovely Curium (Kourion) beach and the fabulous amphitheatre with a view to die for. Erimi is a very residential village, not much has been written about it, and it almost now seems a to be a suburb of Kolossi village across the road. There are many homes that belong to expats, mostly British in this area. It is well situated for a holiday. It is a great location for the beach at curium which is minutes away and has 3 tavernas to choose from and the thriving 2nd largest city of Limassol is only 20 minutes as you speed along the very convenient highway. 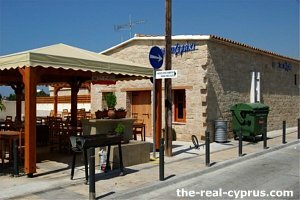 It is also next to Episkopi village which is brilliant for food shopping and a reasonable restaurant at the Episkopi Village Inn. The image of the map above will give you a clear indication of the location of Erimi. I would love to give you a bit of history about the village but sadly the main erimi village website history page is blank and virtually nothing seems to be available to make reference to. If you want to visit the main site for erimi village to see what information is available and some local contacts please go to www.erimi.org. So Is It Worth A Visit? Erimi village almost always never gets a mention in the major cyprus tourist guide books, which is a shame because it does have a charm of its own. It you want to have the real cyprus experience then we recommend you visit both the Cyprus Wine Museum and Michaels Taverna so you don't miss out. You will probably want to also spend some time at Curium (Kourion) visiting the antiquities and seeing the splendid amphitheatre because you are in the area and then perhaps wind your way down to the beach for spot of lunch. The beach and historical sites fall into the Episkopi village district and are so close to Erimi it would silly to be in the vicinity and not see them while you are there! The Cyprus Wine Museum building used to be a restaurant way back when. It was called the Knightsbridge Steak House. It closed in the 1990's and never re-opened but was left looking sad, forlorn and very unloved for a number of years. The building was inherited by Anastasia Gray in 1990, it had been in her family for a very long time. After closure of the restaurant it lay empty for a while until she had the foresight to create the museum, the building it has become today. The site of this museum is very significant and the work to restore the building from shell to authentic cypriot museum was undertaken at great expense and with a great deal of care and patience. It has been a triumph in collaboration using public and private financing and has put Erimi village squarely on the cyprus tourism map. Specialist teams of craftsmen were carefully handpicked for their expertise, the evidence of which you can see in the carpentry and stonemasonry work on the building. The way the stone has been cut and laid and the woodwork details throughout are typical of the area. "Inspired by the fact that Cyprus is one of the first wine producing countries and with the advantage of owning a traditional Cypriot building that has been in my family for generations, instigated the creation of The Cyprus Wine Museum as tribute to this integral part of the history of the island. Erimi village, with its 5500 years history of wine making, is at the crossroads of the wine routes of Cyprus, in close proximity to the prehistoric settlement of Sotira, where the oldest remains of grape seeds have been found and near to Kolossi Castle, a medieval Commanderie of The Hospitaller Knights that give the name to the Commandaria Wine first produced by them, gives to Cyprus Wine Museum its perfect location. " How Do I Find The Museum? 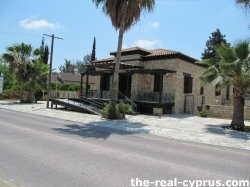 The Cyprus Wine Museum is situated in Erimi village on the old Limassol (Lemesos) - Paphos road. Immediately before the highway. 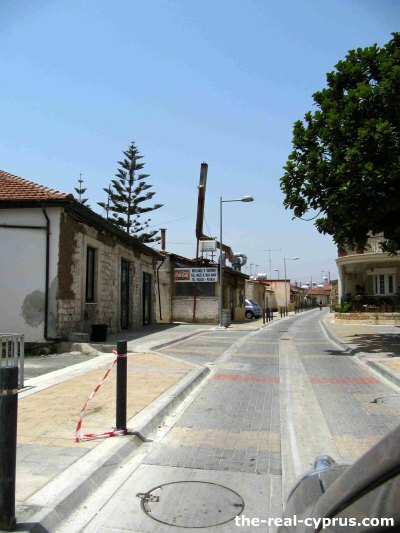 From Limassol central marketplace you can catch the number 16-17 bus, the last stop is 200 metres from the Cyprus Wine Museum. Get off the bus at Poppyies flower shop in Erimi village (Tel: 25 934814) and continue walking in the same direction and you will find the museum just before the Erimi Bridge. By bus the journey will take approximately 30 mins. 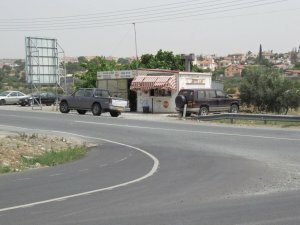 Cypriot people are extremely accomodating and your bus driver or anyone in the vicinity will be more than happy to assist you with any directions you may need when you get off the bus. 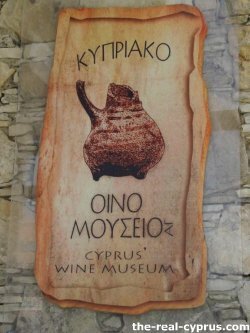 If you wish to impress the local name for the Cyprus Wine Museum is "OINOMOUSIO". Take the Kantou / Sotira exit just after the brige on the highway. Turn left at the T junction, then right at the following T junction which will bring you to the Erimi bridge, turn left to go over the bridge. The parking area for the wine museum is immediately on your right as you come over the Erimi bridge. Take the Kantou / Omodhos exit at the T junction turn right, follow the road which will take you to the Erimi Bridge. Turn left to go over the bridge, the wine museum is on your right just after the bridge. 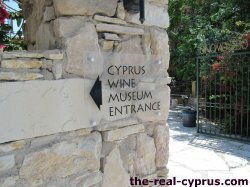 There are signs for The Cyprus Wine Museum to assist you. So Now You Need To Eat! Well, after all that sightseeing and history at the wine museum plus the tastings, and your visit up the hill to Kourion and then all the activity on the beach you must be hungry? 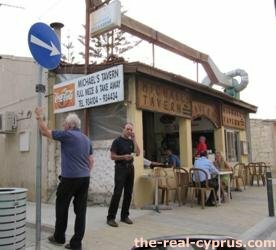 Well the most well known and visited taverna in the Erimi village area is Michaels Taverna. What is special about this restaurant is the building. The restaurant is the original family home of Michael and he has paid homage to his family by using the house in this way. Inside you will find lots of local farming implements, old photographs and you will definately find the real cyprus here. He is a really nice guy, and he will welcome you with open arms if he has not seen you before and certainly greet you like a long lost friend if he knows you. His food is a simple but authentic meze and the prices are still very reasonable, his local wine list is certainly very reasonable. We managed to find this video of Michael playing bazouki, something he is very famous for, and you probably not see him at the weekend during the Cyprus wedding season as he plays far and wide around the island at this time. This will just give you a flavour of Michaels Taverna in Erimi village. Apologies for the quality but many thanks to the person who made the video during a night out from RAF Akrotiri just up the road. The website is back up again now. Here you will find, the menu.. we recommend liver bbq'd if you have never had it before, it is something quite unique to Cyprus in its cuisine. Something to do with using every part of the animal so nothing goes to waste. We always eat bbq'd liver in Cyprus. 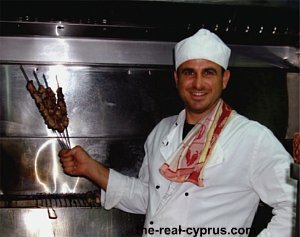 You may as well go the whole hog and have the meze as it is several dishes not much more expensive than having 1 or 2. There are some more photographs of the inside of the restaurant plus you can ring to make a reservation or speak to someone about the restaurant. Hope you go and enjoy it! How Do I Make Reservation At The Taverna? If you want to locate the erimi amphitheatre or Michaels Tavern then you turn right or left, depending from which direction you are travelling. 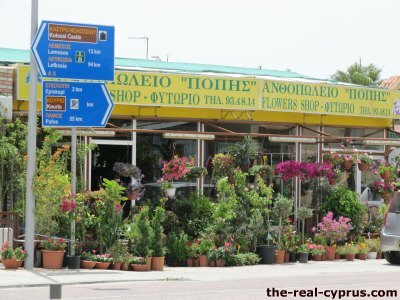 Paphos travellers will turn left, if you are coming from Limassol you will turn right when you get to Poppies Flower Shop. Also highly recommended if you want to purchase a nice bouquet of flowers. You just say how much you want to spend and they will make up a bouquet for that price. You will also get off at the flower shop if you are using the bus from Limassol. This is the square in erimi with an amphitheatre feel to it. In the summer months music and dancing takes place here. 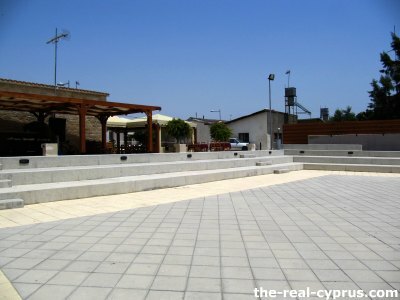 Right on the amphitheatre area is the OUZERAKI Taverna. Run by George who is both chef and owner. The menu is decent, and the prices are reasonable. We usually gauage the price of a restaurant by how much they charge for their cyprus coffee. If its expensive, then so the rest of the menu usuall will be. If the restaurant charges a reasonable price, you know that the locals will probably eat there too. They won't stand for silly tourist prices! If You Just Want A Sandwich In A Hurry! We recommend Androulla and her sandwich shack. She is at the junction where you leave the wine musuem and turn left and then turn right on the road to Troodos. Not strictly Erimi village but close enough not to worry about it. Now she has the cheapest cyprus coffee around. Well worth a cup. Androulla is the most lovely lady. She does not speak much english but she will know what you want. She has the cheapest sandwich around and you can sit and have a cyprus coffee. It is very "rustic" but her mixed sandwich is terrific. We like her halloumi too. 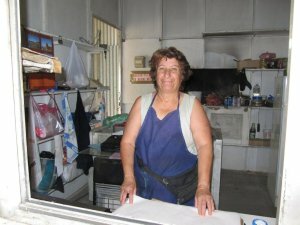 She is from Episkopi Village and has had her little sandwich shop for as long as we can remember.